FILE - Foreign Ministers, Sergei Lavrov, center, of Russia, Mevlut Cavusoglu, left, of Turkey and Mohammad Javad Zarif of Iran attend the international meeting on Syria in Astana, Kazakhstan, March 16, 2018. Russia, Turkey and Iran will hold the next round of their Syrian peace talks in July in the Russian city of Sochi, not in the Kazakh capital Astana like their previous meetings, the three countries said Tuesday. The Syrian rebels said they would boycott the talks due to Russia's role as host. Since they began last year, the trilateral meetings have taken place in Kazakhstan, which is not involved in the Syrian war — unlike Russia, which backs President Bashar al-Assad and has helped him turn the tide of war by deploying its own troops. "We understand that this looks rather strange, but ... taking into account the situation on the ground, the new realities, we would like to give new momentum to further work, shifting the focus more toward the political and humanitarian components," Russia's chief negotiator Alexander Lavrentyev told reporters in Astana. 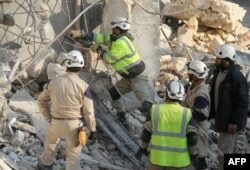 FILE - Syrian civil defense teams work on the rubble of a building in Idlib, in northwestern Syria, on Dec. 21, 2015, following reported Russian airstrikes. "If they invite us, we will not go to Sochi, the armed rebels will not go to Sochi because we must respect our people," he told a briefing in Astana. "Russian forces have not stopped killing Syrian people." In a statement on this latest round, which ends Tuesday, the Turkish Foreign Ministry said it had made clear its "reservations on the forced evacuation operations conducted in Eastern Ghouta and in the north of Homs, as well as on the law that paves the way for the confiscation of the properties of Syrian refugees and IDPs [internally displaced people]." Damascus envoy Bashar al-Ja'afari, who also serves as Syria's ambassador to the United Nations, said his delegation was "content" with the results of the latest talks, but took a jab at Turkey and the United States who back the rebels. "We confirm that … the Syrian Arab Republic will continue its struggle to liberate every inch of our land, be it from terrorism or from states that are aggressors against our national sovereignty," he said.